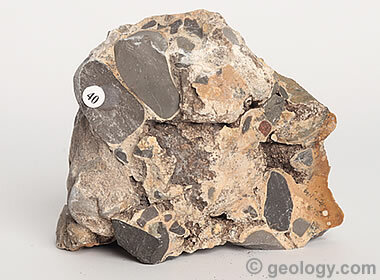 Caliche: This specimen of caliche is composed of rounded rock fragments and fine-grained sediments, bound together with a calcium carbonate cement. "Caliche" is a shallow layer of soil or sediment in which the particles have been cemented together by the precipitation of mineral matter in their interstitial spaces. The cement is usually calcium carbonate; however, cements of magnesium carbonate, gypsum, silica, iron oxide, and a combination of these materials are known. Caliche Horizon: A caliche over one meter thick with mineralization that is heaviest at the top and decreases downwards. 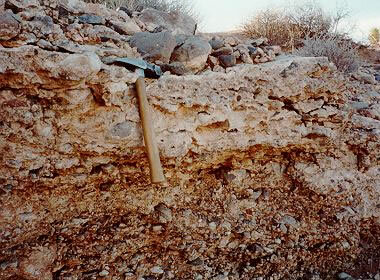 USGS photo of an outcrop in Mohave County, Arizona. Caliche is a common feature of arid or semiarid areas throughout the world. In the United States, caliche is a familiar deposit in many parts of the Southwest, especially in Arizona, California, Nevada, New Mexico, and Texas. There, caliche is associated with problems such as poor soil drainage, difficult soil conditions for plant growth, and excavation problems at construction sites. In some locations there are multiple ancient caliche layers in the subsurface. The name "caliche" originates from a Spanish word for porous materials that have been cemented by calcium carbonate. The name is used to refer to a piece of the material or the layer from which it was broken, or the cement itself that binds the materials together. Caliche is known by many other names, the more common of which are calcrete, hardpan, duricrust, and calcic soil. "Caliche Conglomerate": A conglomerate-like boulder consisting of caliche-cemented gravels. USGS photo taken in the Providence Mountains area, San Bernardino County, California. What Does Caliche Look Like? Typical caliche colors are white, gray, brown and reddish-brown. 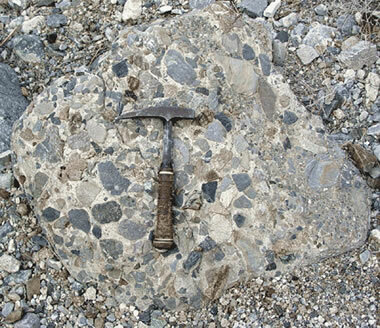 Well-developed caliche can have an appearance that resembles conglomerate, breccia, coquina, or sandstone if the cemented particles are of the proper type and size. Caliche can be a very hard, dense, heavy, and durable material if it is firmly bound by a cement that completely fills the interstitial voids between the soil or sediment particles. It can also be a weak and friable material if it is poorly cemented. 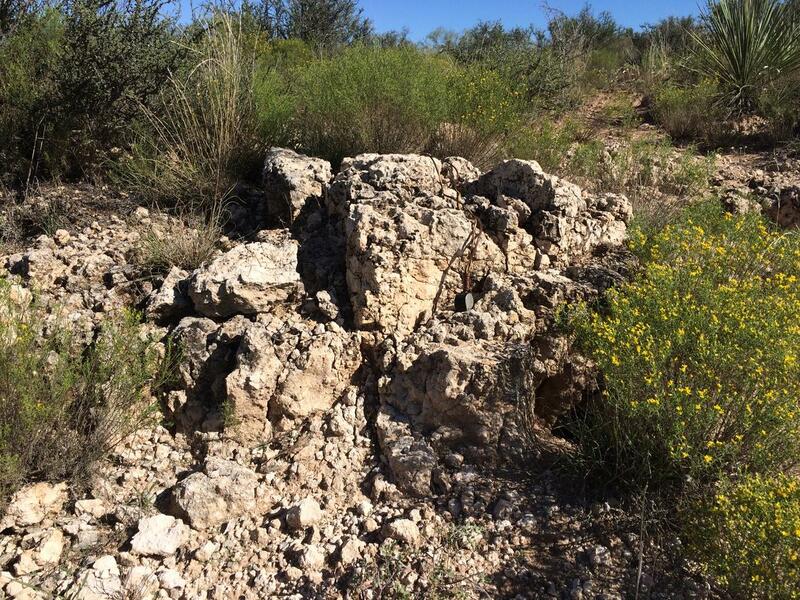 In excavations and outcrops, a well-developed caliche usually stands out as a competent, well-cemented sediment or soil with loose friable material below. Sometimes it is overlain by uncemented surface material. Plant roots might not penetrate a well-developed caliche. "Caliche Terraces": Caliche-cemented gravels form the flat, resistant, horizontal "cap rocks" on the Pleistocene terraces on the banks of the modern dry wash that crosses the area shown in this photo. The mountains in the distance are composed mainly of Paleozoic limestones and dolomites. Weathering of these rocks provided much of the calcium carbonate that enabled caliche formation in the valley. Caliche has a diversity of origins. The major process of forming caliche begins when calcium carbonate is leached from upper soil horizons by downward-percolating solutions. Dissolved calcium carbonate might also be delivered to the site in runoff and then percolate into the soil. The calcium carbonate then precipitates in a deeper soil horizon to form the caliche layer. At first the calcium carbonate precipitates as small grains or thin coatings on sediment grains or soil particles. As the grain coatings thicken, adjacent grains will be cemented together, and nodules consisting of multiple grains and their surrounding cement will form. As cementing continues, a continuous subsurface layer might form. In an advanced stage, a solid caliche layer can develop. These can become so dense and impermeable that they can resist the downward percolation of water and erosion by wind or water. The caliche layer generally has a higher density at the top and decreases downward. Advanced caliche formation can produce a layer that is over one meter thick and have a lateral extent of hundreds of square kilometers or more. Some caliche forms by the upward movement of water through capillary action. As the water evaporates, dissolved materials precipitate, and, over time, can cement the soil or sediment. Caliche can also form beneath vegetation that extracts water from the ground and transpires it into the atmosphere. As large amounts of water are removed by the plants, mineral materials that the plants do not remove become concentrated in the subsurface waters. When the concentration becomes high enough, or evaporation occurs, precipitation begins and can form caliche over time. Caliche Outcrop: A caliche outcrop near Sulfur Springs Draw, Texas. This Pleistocene/Pliocene deposit hosts uranium-vanadate minerals. USGS photo by Susan Hall. Enlarge image. Caliche can be a barrier to the downward infiltration of water. Caliche can be a barrier to erosion by wind or water. When it is breached, downward erosion can be rapid, channeled and severe. Caliche can be extremely durable and present problems at construction sites. Gems and Metallic Ores in Caliche: Caliche can be a host rock for a variety of secondary minerals, including metallic ores and gem materials. 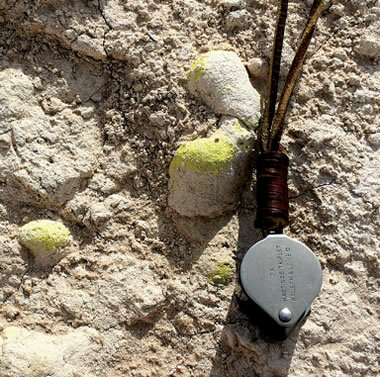 Shown in the photo above are yellow oxides of uranium found near the Sulphur Springs Draw uranium deposit, Martin County, west Texas. Photograph by the United States Geological Survey. Caliche layers in terraced sediments can strongly influence topography. Caliche layers in aquifers can result in the stratified flow of groundwater. Caliche development can incorporate gold, gemstones, and other valuable minerals. 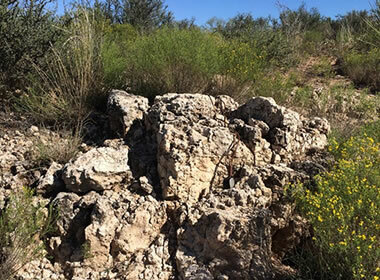 Caliche porosity can serve as the deposition site of valuable secondary minerals, including ores of uranium and vanadium, and gem materials such as turquoise and malachite. Caliche deposits are sometimes correlated and used as relative age and stratigraphic markers. Caliche development indicates a time interval of tectonic, sedimentary, erosional and hydrologic stability. 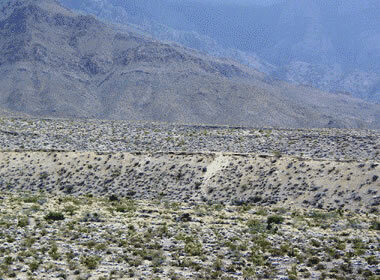 Caliche is often a challenge to agriculture. It interferes with proper soil drainage, the formation of plant roots, and it also can contain soluble minerals that are not beneficial to the plants. Caliche is sometimes crushed and used as fill, aggregate, or as a raw material for making portland cement. It is usually used when higher grade materials are not available or when minimal quality material is sufficient.